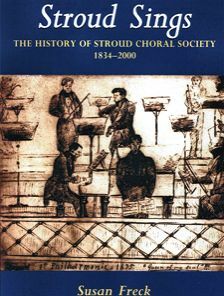 For their Millennium project and following three years of research, Stroud Choral Society has published ‘Stroud Sings’, a social and musical history from 1834 to 2000. Written by two members, Sue Freck and Sue Edwards, ‘Stroud Sings’, 176 pages, 80,000 words and 90 illustrations, is available through members of the Society - price £5 plus p&p or by contacting us. The book can also be purchased at Stroud Choral Society concerts and the Stroud Book Shop in Stroud, Gloucestershire. ‘Stroud Sings’ is also available as a floppy disk for use with Word 6 or Rich Text programmes for the visually impaired, £8 p&p free. To purchase 'Stroud Sings' on floppy disk please contact us.